If your business is a “project business”, as in engineering, construction, specialty contracting or professional services, then you probably spend a fair amount of time and effort attempting to minimize project risk. Customers turn to you because they are looking for an expert that has successfully developed and delivered projects like theirs. They expect that you’ll know your way around the loopholes, potholes and black holes likely to occur along the way. Do you? If you’re up to the challenge, you’ll surely know how to minimize problems during a project but avoiding them all together is typically an unrealistic expectation. You must be a professional at managing and minimizing potential risks and knowing how to effectively work through challenges when they do happen. Careful project planning should eliminate risk? Eliminating project risk entirely is unlikely. The goal is to minimize project risk. Regardless of a service provider’s “proven methodology” or “consulting experience”, complex projects always include unforeseen challenges. In fact, risks tend to become more obvious and more critical after the actual work begins. Often, new challenges arrive during a project because the project stakeholders become more educated about project goals or desired deliverables. “We want 2 bathrooms, not 1 ½.” “Our ERP software needs to integrate with mobile field service apps in real time, not daily”. “We’re merging with another company so there will be twice as many trucks, people and inventory.” Changes as simple as these could result in cost overruns, additional time, regulatory compliance issues, permitting, etc.. You get the picture. Regardless of the size of your project or your role in the project, there are some simple steps you can take to minimize and manage project risk. Be sure you have the right tools for the job. There is no shortage of project management and project planning tools, but be sure you’ve acquired and mastered a tool that fits your needs and skill level. Our company provides advanced project systems that integrate throughout the entire business for larger companies. Project accounting and advanced project management are tied to billing and time tracking, project milestones and an array of communication tools. Clients sometimes spend months designing systems that accurately capture and control every aspect of a project. Smaller companies typically utilize simple tools like Microsoft Office 365 Planner, Excel or Project. Less integration is required, and often not needed to successfully deliver a project. It will always be important to ensure that tools you’re utilizing enhance your ability to deliver and don’t detract from your own process (secret sauce, right?). Project leaders and members alike have a shared responsibility to communicate effectively with each other and the customer as the project moves forward. It is critical to document changes along the way and host reviews regularly to minimize risk. Projects often take on a life of their own when communication is lacking. Be agile, but don’t be a cowboy. Cowboys are great, but if someone refers to you as a cowboy on the project then you’re probably not playing by the rules. Stakeholders should work the plan together and change the plan together to minimize project risk. That’s where “agile” enters. Plans often need to evolve during a project. Working down a poor or outdated path only gets you to the wrong outcome more quickly. Larger companies take this to the next level and employ an Agile Methodology to the project. Agile is a project management methodology that leverages short delivery cycles called “sprints” to focus on continuous improvement in the development of a product or service project. Although Agile was originally designed for the software industry, many types of companies have since adopted the use of agile in their development of products and services because of the highly collaborative and more efficient nature of the methodology. Agile is often used in marketing and advertising, construction, industrial equipment and other complex project-centric industries. I’ll write another post on Agile in the future, but a quick google search will turn up thousands of resources in this area. Here is a great article on Agile from CIO you may find interesting. We owe much of our success to how well we minimize project risk. Sopris helps project-centric and field services companies deploy solutions that often incorporate a wide variety of technologies. We minimize risk by leveraging our proprietary Sopris Assurance® methodology to ensure successful business outcomes. As a hybrid methodology of classic Waterfall and Agile best practices, Sopris Assurance represents the learnings of more than 200 implementations. Through a set of pre-defined deliverables, roles and responsibilities, the methodology leverages a strong governance model, documents the required deliverables by phase, and is heavily focused to minimize project risk. Sopris Assurance was designed by a Six-Sigma black belt. The result is a process that eliminates waste and non-value-add tasks that are inherent in many other methodologies. 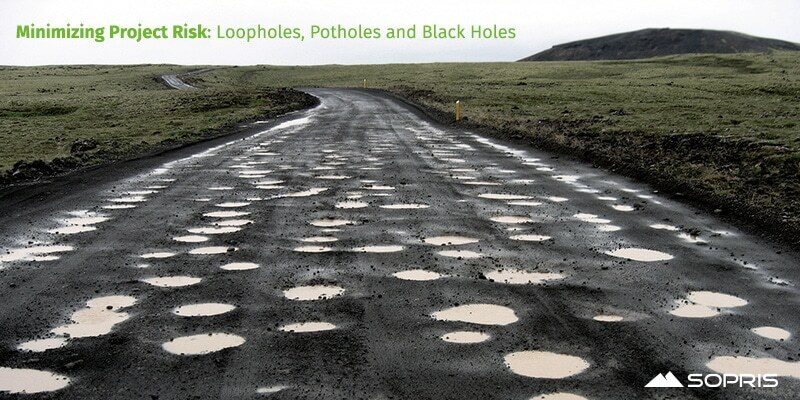 Please reach out if you’re looking for a specific technology solution or would like to learn more about how Sopris Assurance can help your company avoid the potholes, loopholes and black holes that often accompany complex projects.